A sailboat raft-up in Maynadier Creek off the Severn River, Annapolis. Bryan Kroschinsky heads out of Kent Point Marina inlet for oyster dredging on a chilly Chesapeake day. Tall ships docked at the Chestertown Marina during downrigging weekend. Sunset rainbow, Great Wicomico River. Salt marsh, Old Ferry Landing, Assateague Island. The sky had been mostly blue, but when the sun dipped behind the cloud, it looked like it was two different days, gold on one side, dark blue on the other. Kids doing what kids should be doing in the summer—having the time of their lives. October 2017 Kadey Krogen Rendezvous raft up. Calvert Marina hosts the annual Kadey Krogen Rendezvous - Solomons Bridge in the distance. We love our Krogens!! A Great Blue Heron scanning for food, taken at Blackwater NWR. A fast moving summer storm closes in on Back Creek in Eastport. 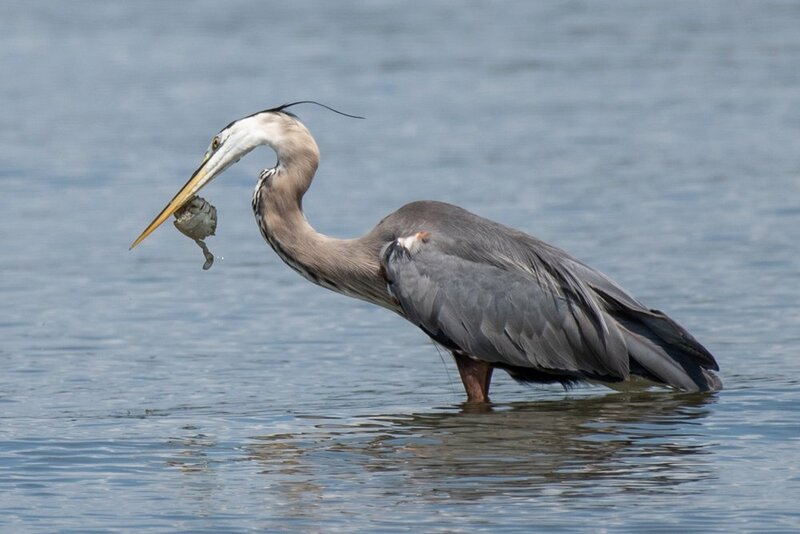 Great Blue Heron eating a blue crab. On the bay, near Franklin Point. August 2018. Great Blue Heron spreading wings. On the bay, near Franklin Point. 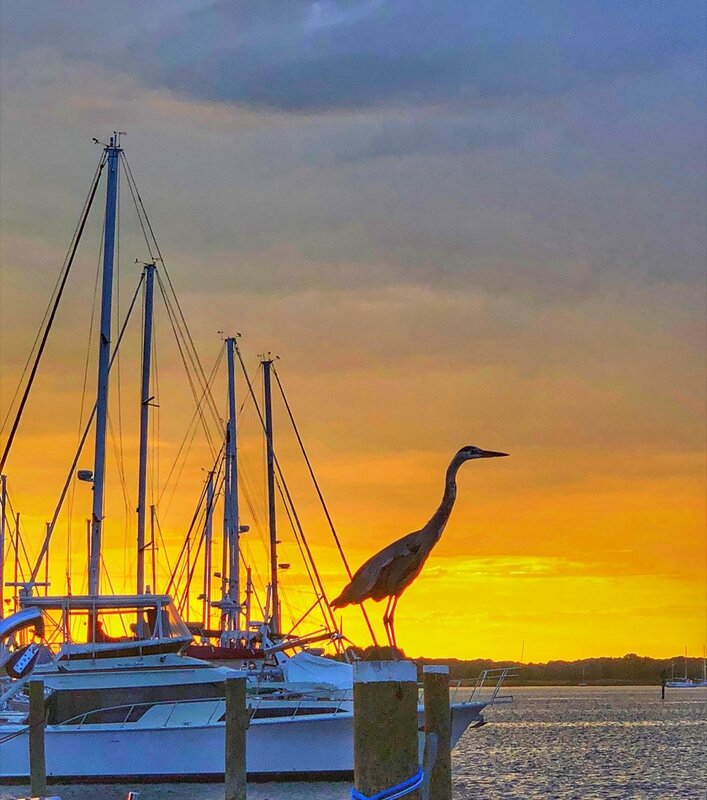 I captured a Blue Heron on a piling next to my boat at Haven Harbour Marina in Rock Hall, with another magnificent Chesapeake Bay sunset in the background. Photo of a great white egret taken at Blackwater NWR. Taken alongside our boat in July 2018 outside the West Basin Marina on the Patuxent River. Mom and baby! Blue Crab from the Chesapeake Bay. We were out in the Bay off the shore from Northumberland Co trying to fish for croaker but the only thing biting that day were the crabs. All tossed back though, after the photo opp. The rigging of a watermen's boat is seen in the reflection of this deadrise. Taken at the Small Boat Harbor, Crisfield, Md. A dolphin swimming on the surface of the bay off of Poplar Island. A crab swimming on the surface of the bay. 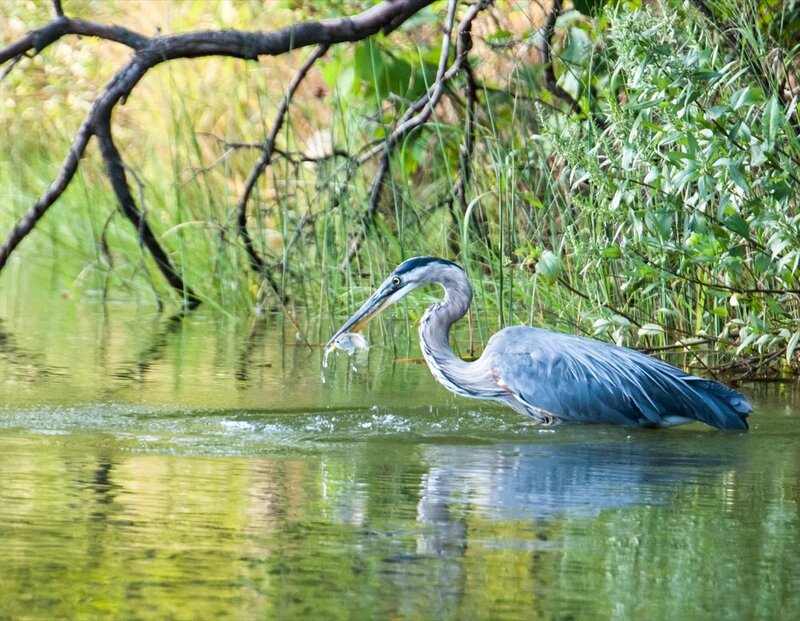 I came across this great blue heron when I was kayaking in Saltworks Creek, near Epping Forest Community in Annapolis . I tracked it as it slowly walked along the shoreline and took this shot right after it caught a fish. The late afternoon light lent a golden hue to the background. Let's have dinner! Taken in Herring Bay on a pound net pole. Can you see me now? 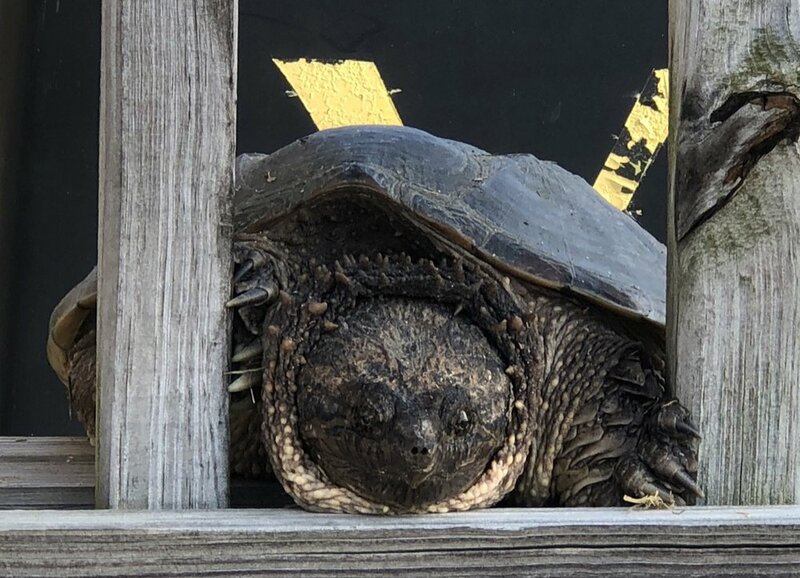 Caught this turtle looking through the railing at us on the dock. 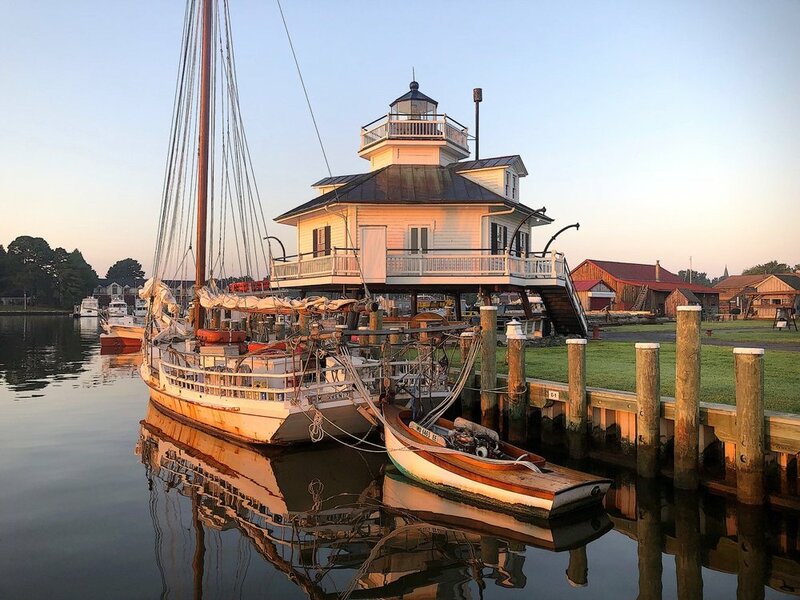 The skipjack H.M. Krentz at her home port of St. Michaels, Md, docked in front of the Hooper Strait Lighthouse at the Chesapeake Bay Maritime Museum. My wife Joanne & I were paddling at Janes Island State Park on a perfect day in August 2018. We asked our readers for their best shots of the Bay, and thanks to all of you who answered the call! 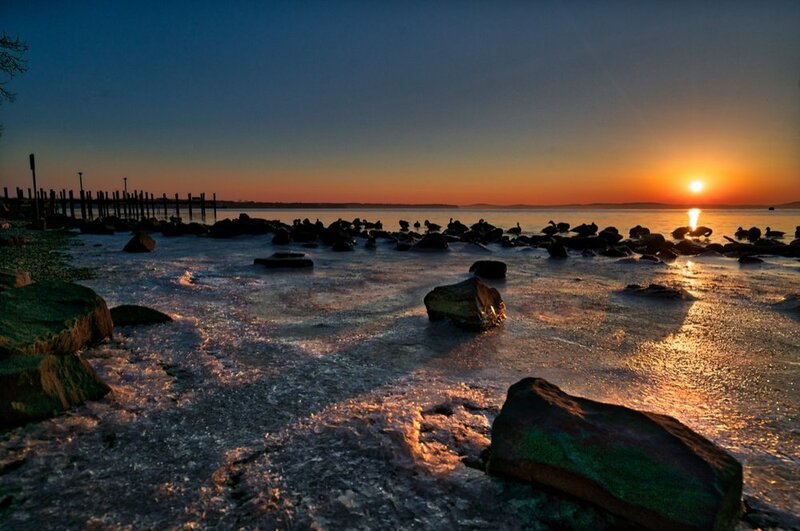 Your pictures provide a glimpse of your own vision of the Chesapeake life that we all enjoy.